If you are travelling in Malaysia, I definitely recommend you visit the Perhentian Islands for some great dives and a very affordable version of Paradise. Just back from diving the Perhentian Islands in Malaysia – a glorious place to go scuba diving. I’m writing up my article about it for Asian Diver magazine which won’t get published for a few more months, but here’s a quick Q&A guide that should help explain some of the Perhentians’ attractions. The diving season is April to October. From October to April the monsoon season shuts down the island and the seas are too rough to make the crossing. Is it a tropical paradise? Perhentians scuba diving is excellent – It has a collection of 10 or so dive sites, the max depth of which is around 24 metres. Highlights include two shipwrecks, the Vietnamese Wreck, which is upside down, and the Sugar Wreck, which is lying on its side with two cranes still attached to its deck. There is also the labyrinth of rocks and boulders known as T3 (Terumbu Tiga) and the pinnacle which is variously called Temple and, er, The Pinnacle. The reef in D Lagoon is excellent for a long, shallow dive too. What can I expect to see underwater? Over the four days I was diving at the Perhentians I saw several turtles, a black tip shark, triggerfish, tiny yellow boxfish (deeply cute), huge puffafish (up to half a metre in length), razorfish, octopus, schools of barracuda, jacks, fusiliers and travallies, a squadron of squid close to the surface and a truly giant moray eel. These are the things I haven’t seen but was told about: There have been sightings of the shovelnose guitarfish at T3 on occasion, and a couple of divemasters found a seahorse by going off one of the wreck dive sites; big marble rays and cobias are also spotted too. Apparently a few years ago a solitary manta was occasionally seen around the islands, possibly lost on its way to the Philippines – no-one’s quite sure. What’s the setup for diving? Viz varied quite a lot from day to day when I was there – usually around 7 or 8 metres on the wrecks, going up to 15 metres at The Pinnacle. Viz is always better first thing in the morning. 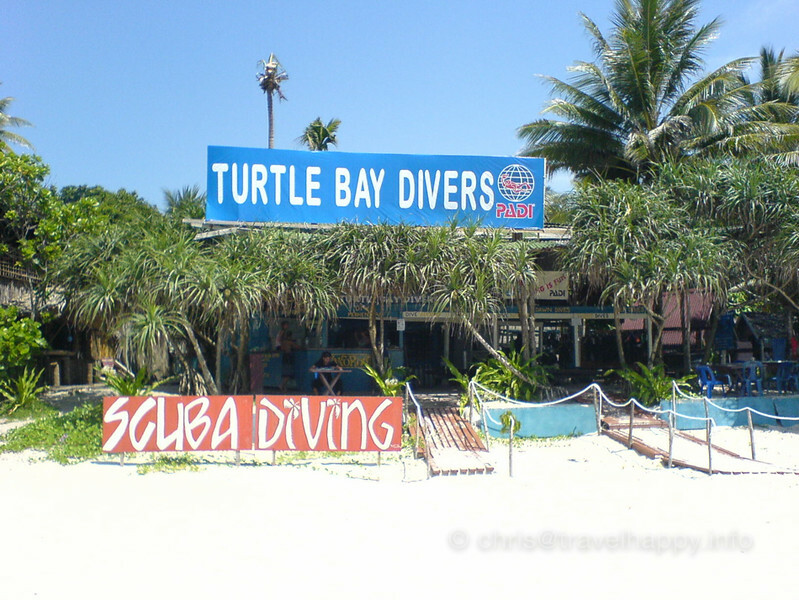 Are the dive sites crowded? When I was there in late June, the dive sites were almost empty. I’ve heard reports that they can get pretty crowded sometimes, usually at weekends when lots of people come up from Singapore. The dive shop I dived with charged RM80 per dive [RM = Malaysian Ringgit, see currency converter at xe.com] including all scuba gear, boat and divemaster. The price goes down to around 60 RM a dive if you do several days diving. I’d say there’s enough at the Perhentians to keep divers entertained for at least 3 days, probably longer. I would definitely recommend doing a daytrip to nearby Palau Redang as well, which only takes 40 minutes in the speedboat. Do you recommend a specific dive shop? The Perhentian Islands are divided into Perhentian Kecil (Small Island) and Perhentian Besar (Big Island). Besar is more family orientated and a bit more upmarket and quieter. Long Beach on Kecil is the backpacker beach. with the most going on in terms of apres-dive partying. I saw several other small beaches around the islands where you can also stay, but bear in mind getting a boat is usually the only way of moving between beaches, so you probably won’t want to move around much. If you’re looking to book Perhentian accommodation, check out the reviews of Perhentian resorts and guesthouses on Agoda, where you can also book online. There’s also a bunch of hotels on Palau Redang, around 45 minutes away from the Perhentians and a great dive spot in its own right. Have a look at the Berjaya Redang Beach Resort, the Aryani Resort, the Tanjong Jara hotel and the Primula Beach resort. Fly into Kota Bharu from Kuala Lumpur (a 50 minute flight) with AirAsia. Then get a cab direct from the city airport to Kuala Besut, a town on the coast. The taxi takes around an hour and costs 50 RM. 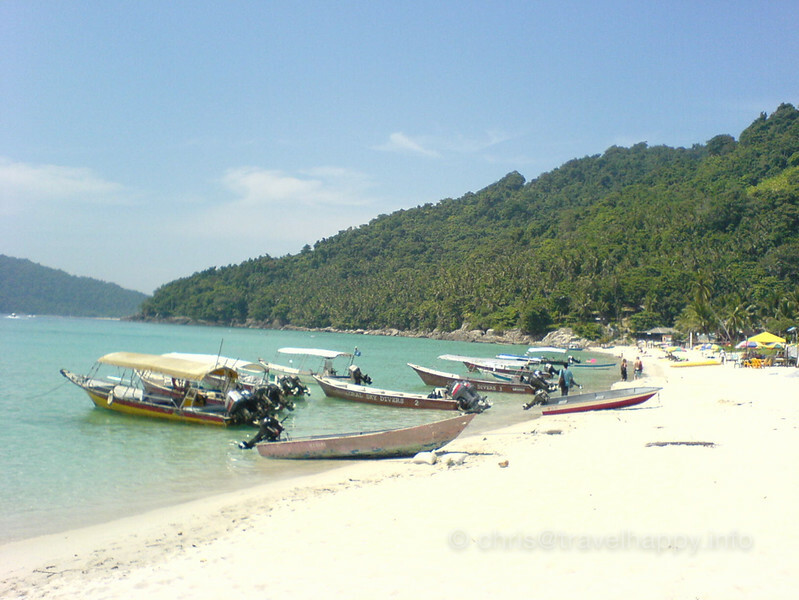 From here you can get a speedboat out to the Perhentian Islands – the boat takes about half an hour (Return ticket 30 RM). Boats run out to the islands until around 6pm. Arriving on the islands as early as you can is advisable as accommodation can be scarce later in the day unless you’ve booked ahead. Accommodation is around 50 to 80 RM for a wooden hut with en suite bathroom. The Perhentian Islands are still quite basic so you need to bring everything with you besides food and water – mosquito repellent, suncream, sunglasses and a hat are all very advisable. The Perhentians lies in the strict Islamic district of Teranngu and while the islanders are very laid back, alchohol is very pricey by usual Asian standards – RM8 per beer. Stashing a bottle of spirits might be a good idea before you set out. Travellers should also remember to keep covered up when travelling through Terengganu to the Perhentians to avoid offending local sensibilities. Keep your bikini for the beach!